Running a blog speed test is one of the first things you should do when learning how to check your blog performance. Learn more about blog speed tests today. Did you know that your blog performance can affect your blog traffic? A slow blog may lead to less visitors and less clicks. This means less income if you are blogging for money. Learn how a blog speed test can help you to improve your blog today. What is a Blog Speed Test? 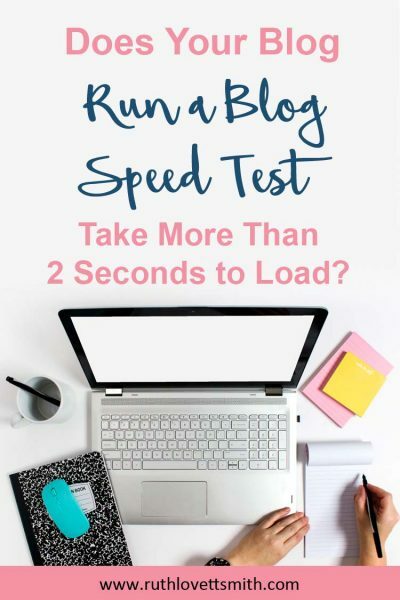 A blog speed test is a test that will show you how quickly your blog, or blog page, takes to load. Why Run a Blog Speed Test? Blog speed is important because a quick loading blog keeps visitors on your site. If your blog takes too long to load, visitors will click away. It’s important to run a blog speed test every so often, as your blog grows and changes. How Fast Should My Blog Load? Visitors like FAST sites. Current data states that a blog should take 2 seconds or less to load. Any more than that and you risk visitors leaving your site before it even loads. It’s important to keep in mind that search engines may also factor in site speed as a ranking factor. Sites with quicker load times are likely to get ranked above yours. Pingdom lets you test your blog speed from various countries. The site offers speed results, a letter grade, and suggestions for improving your site. Google Page Speed Insights lets you test your page speed for multiple devices. It also gives you suggestions for improvements. Dotcom Tools will do a blog speed test from various cities, and countries. This tool will list out the time it takes to load your site from each of the cities/countries it tests. GTMetrix will let you run a blog speed test and give you performance scores as well as actionable recommendations. If you are looking for more free tools, simply do an internet search for “blog speed test” or “website speed test”. 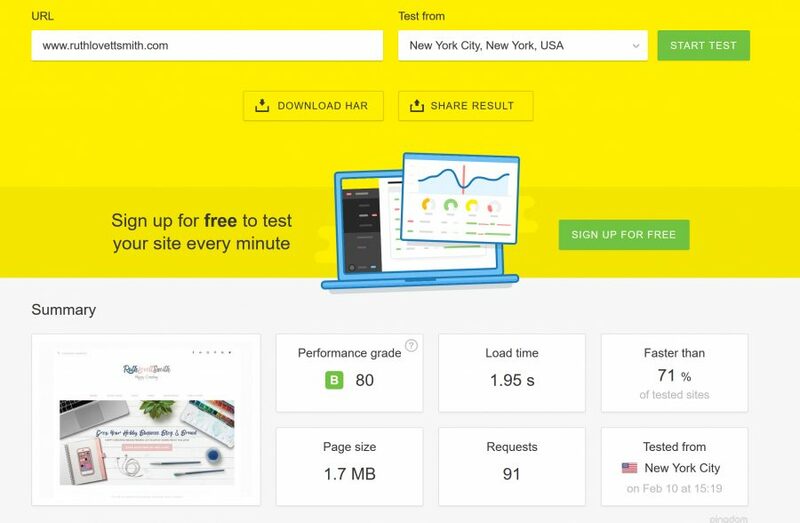 Below is an example of a blog speed test, of this website, from Pingdom. Most of the websites above will give you suggestions on what you need to improve. A cache is a hardware or software component that stores data. Requests for data stored in a cache can be served faster. WP Super Cache is a plugin you can add to your WordPress blog. This plugin generates static html files. Your webserver will then serve those files instead of processing heavier WordPress php scripts. Another popular caching plugin is WP Rocket. Using a caching plugin will help to improve your blog speed significantly. Image size is another item that can slow down blog speed. When discussing image size, we are talking about the size of the file and not the dimensions of the image. The images you use on your blog do not need to be high resolution. High resolution images are for printing. If you are taking your own photos, or using stock photos, make sure that you save a low resolution copy for use on your website. A good size for web is 72ppi, or pixels per inch. Many photo editing programs, like Photoshop, also have a “save for web” feature. Images should be saved as a JPEG. PNG is a second choice, though older browsers may not support it. If you aren’t comfortable with how to decrease image sizes, you can try the plugin WP Smush. It will decrease image sizes for you. Plugins can add great features to your site. However, they also slow your site down. Choose your plugins wisely. You should also deactivate and delete any plugins you do not regularly or currently use. Some developers and themes are more efficient than others. Does your theme developer offer support? Is your theme regularly updated? These are just a few things to consider. An out of date theme can slow your blog down. For this site, I use the Genesis Framework by StudioPress. Genesis is an amazing parent theme that offers a lot of features. I’ve written a detailed review on Genesis, why I use it, and why you should too. Click on Why I Use the Genesis Framework for more information. If you run a blog speed test, and implement any suggested changes, you will increase your blog speed; which will help with your search engine ranking results. Thanks Fana for stopping by and commenting. I’m so glad you found my suggestions helpful! Such a timely post for me. I’m working on optimizing my images to improve site speed at the moment. I’ll have to try some of the other ideas you have shared. Thanks so much!